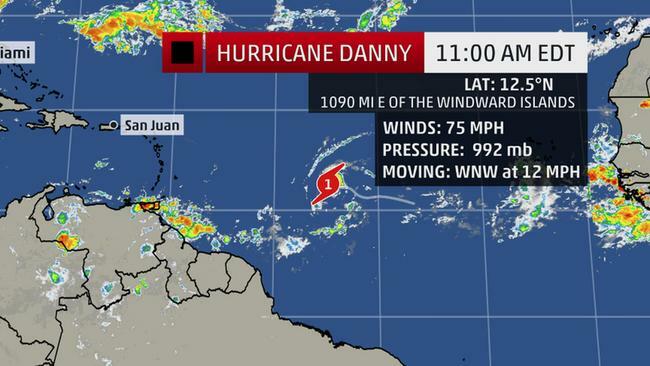 MIAMI – Danny has become the first hurricane of 2015 in the Atlantic. The National Hurricane Center said Danny ramped up in strength and appearance today, developing a more symmetrical structure and an eye. Its wind speed also increased to 75 mph, making Danny a Category 1 hurricane. 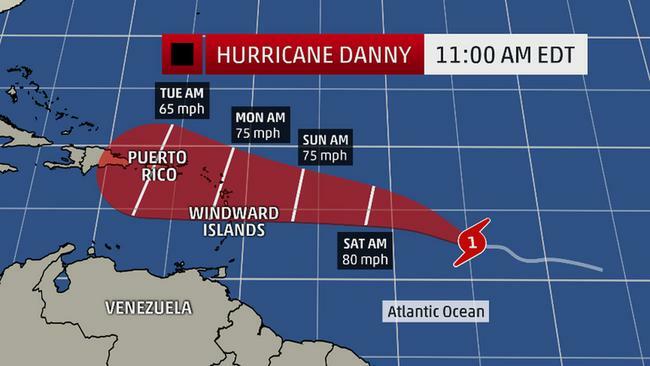 As of 11 a.m. EST Thursday, Hurricane Danny was located about 1,090 miles east of the Lesser Antilles and was moving west at 12 mph. Danny is a very small storm in an area with low wind shear, which is expected to continue for the next few days, the hurricane center said. That could allow Danny to stay a hurricane for a while before wind shear picks up again and weakens the storm. Danny is expected to turn more to the northwest and plod along slowly over the next two days, the hurricane center said. That path will eventually take it very close or over the Lesser Antilles. Where will Danny eventually go – and will it affect the Virgin Island? Meteorologists say if the storm enters south of St. Lucia/Guadeloupe it is more likely to make an appearance in the territory. And with Virgin Islanders suffering from below-average rainfall conditions since February, some much-needed rain is most welcome. The hurricane center noted earlier today that two of the computer models it uses weaken Danny to a tropical wave in the Caribbean, however the official forecast keeps Danny at hurricane strength through the next 96 hours.